If it's so dead, what's that then? 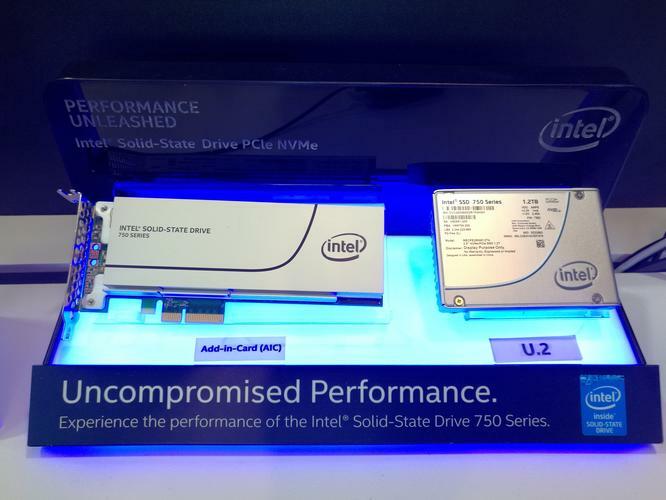 The two faces of Intel's NVMe SSDs. One plugs into a PCI slot, the other plugs into a "mythical" U.2 port. After three meetings in a row on the morning of Day 1, our hopes seemed dashed. First up was a Product Manager from OCZ saying that its new NVMe SSD, "Was only available as an add-in card and not a U.2 form factor and, honestly, U.2 is dead on arrival. It really isn't taking off. It's really more for enterprise. None of the motherboard manufacturers have that. If anything they'll sell you a U.2/M.2 adaptor." "I've been keeping in contact with the local [motherboard] guys: it's on their list, but it's only something like at the bottom of the list... There's no performance difference and you can get a pass-through adaptor to M.2 and this is a much better form factor. System builders like it because it's flush with the board and you don't have to drop cables anymore. And most of the modders I talk to, they'd rather prefer M.2 to U.2. And the honest truth why Intel doesn't have an M.2 is, their controller doesn't fit on it. It's too thick. That's why they're pushing U.2. It is a much more expensive piece of hardware." Meanwhile a Product Manager from Sandisk showed us its new SSDs. There was no U.2 drive and only one early-model, technology-demo NVMe drive running. We were told that, "As exciting as NVMe is, not many people are buying it... 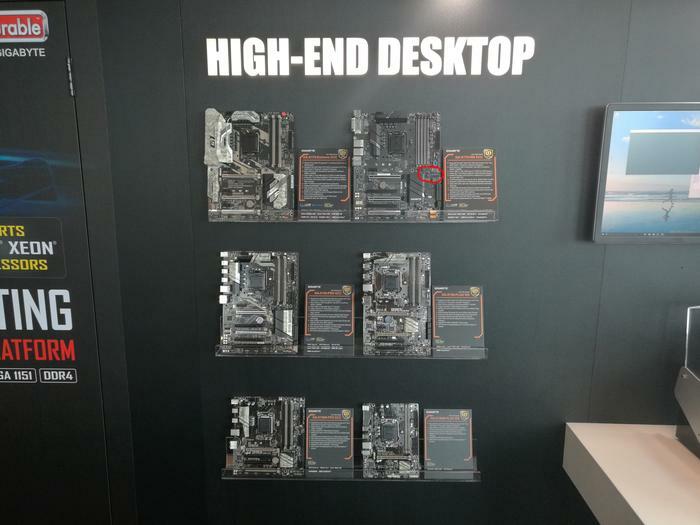 There's a lot of folks raving about it and the high-end motherboards have M.2 [connectors] in order to do it and that's fine, but the reality is it's still 3-4% of the market and that's probably in dollars. In units, probably worldwide, we'll be lucky if we hit 2%. And so when you start looking at it that way it's like, well, I'm the global intel guy, we'll probably do something with it but it's not [our focus]." Moving on to Ballistix (which as of today becomes an equal brand (not a sub-brand) of Crucial) we were told by a Product Manager, "For right now I think it definitely is [a non starter]. But we're definitely keeping an eye on it as a company. "I can tell you that in the general upgrade world it does give you a little more flexibility from a form-factor standpoint. And then, if you want to do big drives, like 2TB, 4TB, 6TB, you definitely have more placements. So while I think there's not a lot of demand right now, I think that if you look out there in few quarters, let's see what the market does. So it's on my radar... I think it might be a ways off." 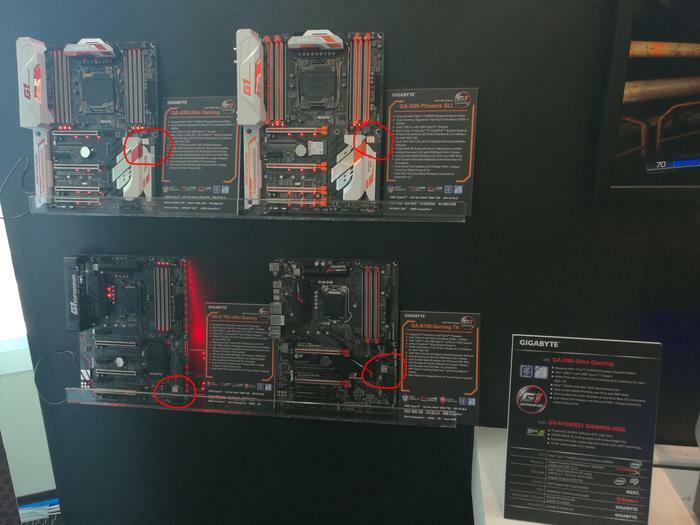 Gigabyte's new, high-end G1 Gaming motherboard range all has U.2 ports. 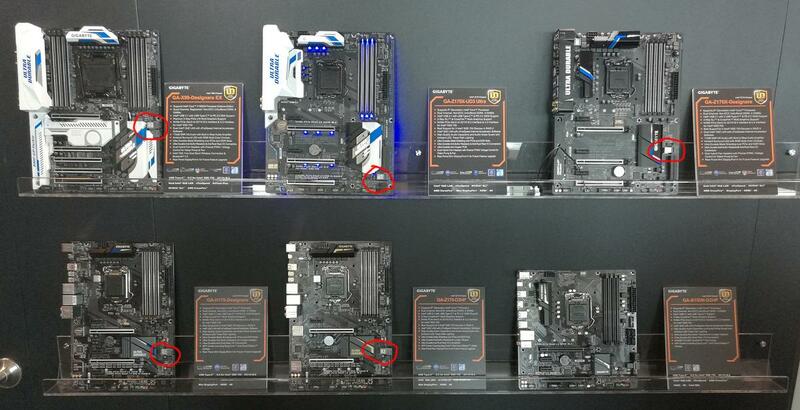 Most of Gigabyte's new mainstream motherboard range has U.2 ports. U.2 is also available on Gigabyte's Workstation range. Verdict: We've gone from having a few NVMe U.2 drives and nowhere to plug them in to having motherboards with U.2 drive sockets and key SSD makers not making drives for them. But if one of the main motherboard makers has sockets on most of its boards, surely U.2 will finally start to grow.